Nearly everything on this earth has some sort of symbolism behind it. Some things are better known for one type of symbolism, or known for the wrong type of symbolism. This happens often with birds. The brightly colored birds are usually symbolized correctly to represent happiness and joy. Some of the darker colored birds are not so lucky and are usually misrepresented in common symbolism. For example, the raven is a bird that really symbolizes wisdom and other great traits, while the common person will only think that the bird symbolizes death and evil, two things which it definitely does not symbolize. When it comes to the white dove, this bird is symbolized by many peaceful qualities. Luckily, it is not misrepresented like the raven. The average person is aware that the dove animal totem represents tranquility and grace. 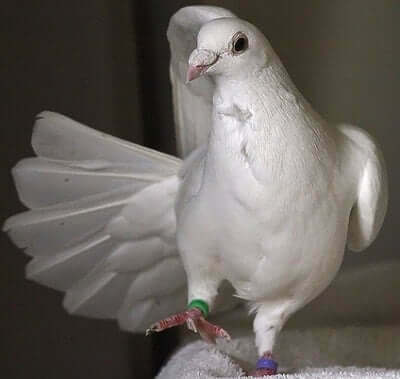 In this article we will discuss one of the white dove’s main symbolism points, and that is how the white dove perfectly symbolizes love, both romantic, friendly, and family-oriented. Part of the white dove’s symbolism simply comes from the color of the dove itself. The color white symbolism is nearly everything that the dove itself represents. The color white by itself symbolizes purity and innocence. Positive energy springs from the white dove, which could be why the bird is so often representative of love. Of course, many other animals and plants can symbolize love in general, but the dove seems to symbolize a specific kind of love, a pure love. Another reason why the white dove represents love is because of the “coo” sounds that doves make when they are “talking” to each other. There are many stories and myths about the white dove’s coo in many cultures from all over the world. The Native Americans believed that the dove could communicate with the sky, announcing when it was going to rain. This culture specially associated the bird with water. It may be a coincidence, but the dove does share many symbolic qualities with water, such as purity. Across the ocean, in ancient Christian religions the dove was used to symbolize the divine, or Jesus Christ. In some Christian religions the white dove could also represent the virgin Mary. Either way, the dove is once again shown to related to pure beings, backing up the bird’s own symbolism. When it comes to romantic love, the white dove is a great sign for pure love. The dove is in no way a sign for an abusive relationship or a relationship that is full of deception. The dove symbolizes honest and loving relationship. This doesn’t mean that you need to be a virgin until you are married to have a pure relationship. You simply need to love your partner will all of your heart, and stay loyal to them. Treating your partner with kindness is the best way to do this. All of the qualities of a healthy relationship – love, tenderness, trust, honesty, loyalty, faith, and patience – are all shown in the dove, making it the perfect symbol for love. Some people think that seeing a dove is a sign of love to come, whether romantic or in another form. This could be because white doves are often found in pairs. The doves seem to communicate well with each other, just like couples in healthy relationships. Sometimes seeing a dove can seem like a hopeful sign, as they are hardly ever the bearers of bad news. If you see a dove then the rest of your day is likely to be good. You may get good news, meet someone new, or even get rid of someone who is harmful to your life. When you do get into a relationship, you should try to stick to the virtuous nature of the dove to have a safe and healthy relationship. Remember to honor each other and to be honest and loyal to each other as well, just like the white dove. It was really nice how you said that because white doves represent tranquility and grace in the animal totem, they also serve as the perfect creature to symbolize love either romantically, friendly, or family-oriented. I guess that’s the reason why my mom won’t settle until we find a dove to release for my older sister’s burial this week. She has been such a kind soul, so I’m not surprised that even in death, people still want the best for her. I’ll go find the cutest and whitest dove for her and hope it leads her to heaven. Thanks for sharing.